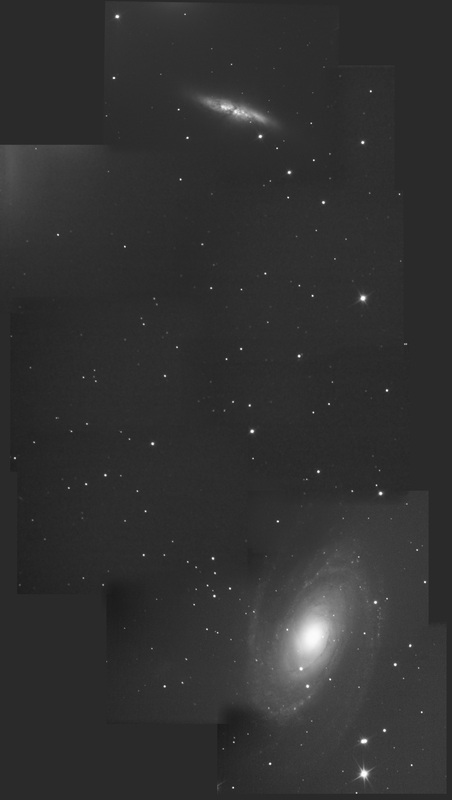 Ever since I first pointed a webcam down the business end of a telescope, I'd wanted to make a mosaic showing both M81 and M82. On 27th Feb 2005 I captured a satisfactory image of M82. 82x26s frames @ 75% gain. 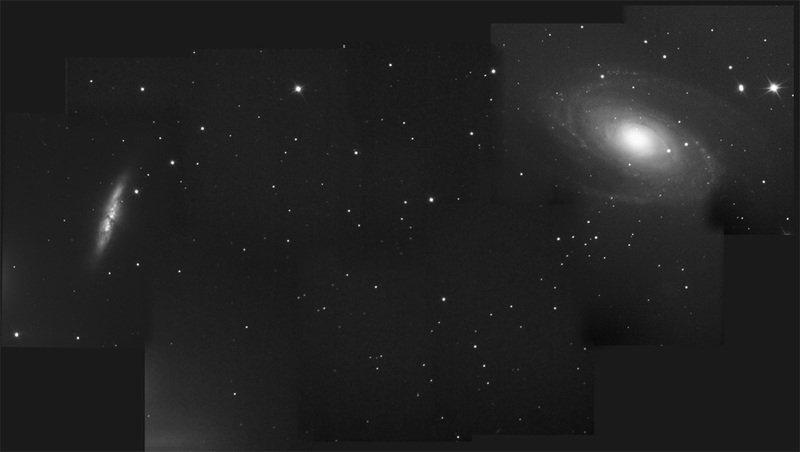 On 3rd March I captured 3 sets of 100*15s frames of M81 @ 100% gain. Then I captured 7 sets of the intervening part of the sky. Aprox 40x15s @ 100% gain for each part. These were stacked in registax 3 and curves in photoshop. Photoshop was then used to construct the final image. The following image is resized down. Vertical scale is about 1 degree. This was my first attempt at this mosaic. Mosaics of large areas of mainly blank sky are quite tricky - I need to work on more accurate dark and flat fields. THe inceasing clouds caused the brightening to left of M82. Its common to find that if you adjust an image to match the one to its right, you'll find it won't match the one to the left and so on! Hence you can see joins quite clearly, however the image does perform its function of putting these two wonderful galaxies into perspective. M82 is the spindle shaped galaxy at the top, and M81 is the classic spiral at the bottom. Galaxies UGC5336 and PGC28848 are also just visible. 5336 is the dim smudge left of M81, and PGC28848 is the tiny smudge on the very far left of the image, about level with the top of M81.